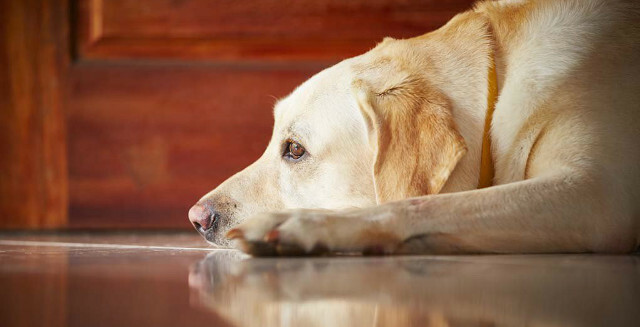 Separation related behaviours (SRBs) are unwanted behaviours when dogs are left alone. Most common are destruction, toileting, barking or howling. There are different reasons for dogs to show these behaviours when left alone, but the most common is where they have never learnt that being alone is a normal and OK part of life. For these dogs, the problem is known as separation anxiety. Please note that not all puppies and dogs will overcome this issue, for some this is an ongoing path which can be made easier with some preventative measures to help your distressed pet and its owner. Your dog(s) become distressed as soon as you leave. The first 15 minutes are the worst, during which time your dog becomes extremely upset. All the physiological signs of fear may be present – an increase in heart and breathing rate, panting, salivating, increased activity and, sometimes, a need to go to the toilet. Your dog may try to follow you as you leave, scratching at doors, chewing at doorframes, scratching at carpets or jumping up at windowsills to look for a way out. Alternatively your dog may bark, whine or howl to try and persuade you to come back. After this frantic period, your dog may settle down to chew something that you have recently touched that still carries your scent. Dogs will often chew scented items into small pieces and curl up in the debris so that your dog forms a ‘barrier’ of your scent around them for security. On your return, your dog may appear elated and may become very excitable. They may be wet, either from salivating or excessively drinking due to stress. When you are home, your dog may attempt to follow you wherever you go in the house. They may begin to display anxious behaviours when they see you preparing to leave the house (eg panting, pacing). Get yourself ready and try to follow the same routine when you are getting ready to leave the home. Once your dog is comfortable and tucking into something tasty, leave the home as per normal. Return after a few minutes (before your dog starts to become anxious). If your dog is comfortable with this length of time, fantastic! Repeat a few times over the course of day. If your dog shows any sign of worry, take a few steps back and start from where they were last comfortable, it sometimes takes a few tries to get your dog to stop worrying. Many people leave a radio on for background noise and company. Some dogs will get use to this in a matter of no time, but others may need more time to adjust, so take it very slowly as it is a learning curve for your pet. If you find your dog begins to look worried when you pick up your keys or put on your coat, then you will need to spend some time ‘desensitising’ your dog to these particular sounds. You can do this by regularly popping your dog in the area during the day as before and get them used to seeing and hearing you pick up your keys, coat or bag. At this point, it’s important not to actually leave the house – just allow your dog to get used to these sights and sounds while they are relaxed and comfortable. Once they look calm when they see or hear these things (this may take several days), then you can start again with actually leaving the house for short periods of time. Keep greetings friendly, low-key and predictable on your return, even if you come home to find your dog has chewed something or toileted. It’s important to understand that punishment won’t help your dog – just go back a few steps and start again, it all takes time and much understanding. If you need further help and advice on this subject in order to help your own pet, then please contact your vet for further information.